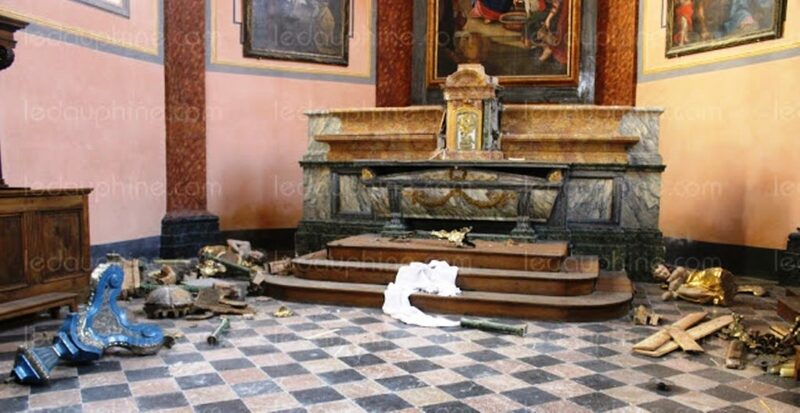 The vandalized altar of a historic church in Thonon-les-Bains, France. In France, two churches are violated every day. According to PI-News, 1,063 attacks on Christian churches or symbols (crucifixes, icons, statues) were registered in France in 2018. This represents a 17 percent increase compared to the previous year (2017), when 878 attacks were registered—meaning such attacks are only going from bad to worse. Vandals plundered and used human excrement to draw a cross on the Notre-Dame des Enfants Church in Nimes; consecrated bread was found thrown outside among garbage. The St. Nicholas Catholic Church in Houilles was vandalized on three separate occasions in February; a 19th century statue of the Virgin Mary deemed “irreparable” was “completely pulverized,” said a clergyman, and a hanging cross was thrown to the floor. Vandals desecrated and smashed crosses and statues at Saint-Alain Cathedral in Lavaur; they mangled the arms of a crucified Christ in a mocking manner; an altar cloth was burned. Arsonists torched the Church of St. Sulpice in Paris soon after midday mass, on Sunday, March 17. Another telling indicator is that European regions with large Muslim populations often see a concomitant rise in attacks on churches and Christian symbols. Before Christmas, 2016, in the North Rhine-Westphalia region of Germany, where more than a million Muslims reside, some 50 public Christian statues (including of Jesus) were beheaded and crucifixes broken. In 2015, following the arrival of another million Muslim migrants to Dülmen, a local newspaper said “not a day goes by” without attacks on Christian statues. As a typical example, in 2014 a Muslim man committed “major acts of vandalism” inside a historic Catholic church in Thonon-les-Bains. According to the report (with pictures) he “overturned and broke two altars, the candelabras and lecterns, destroyed statues, tore down a tabernacle, twisted a massive bronze cross, smashed in a sacristy door and even broke some stained-glass windows.” He also “trampled on” the Eucharist. For duplicate examples in other European nations, see here, here, here, here, and here. Hardly anyone writes and speaks about the increasing attacks on Christian symbols. There is an eloquent silence in both France and Germany about the scandal of the desecrations and the origin of the perpetrators…. Not a word, not even the slightest hint that could in anyway lead to the suspicion of migrants… It is not the perpetrators who are in danger of being ostracized, but those who dare to associate the desecration of Christian symbols with immigrant imports. They are accused of hatred, hate speech and racism.